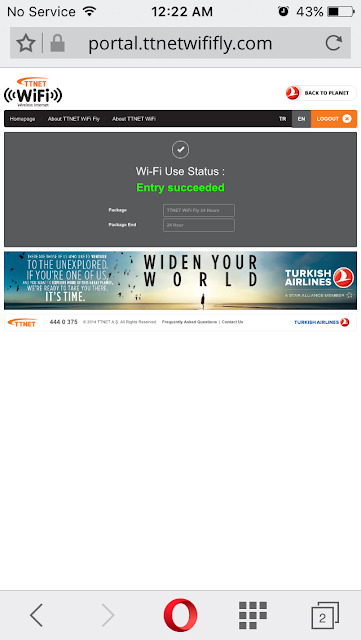 After two years of planning and Aeroplan-points-collecting, our journey finally started here at Pearson Airport in Toronto in late October, 2015. 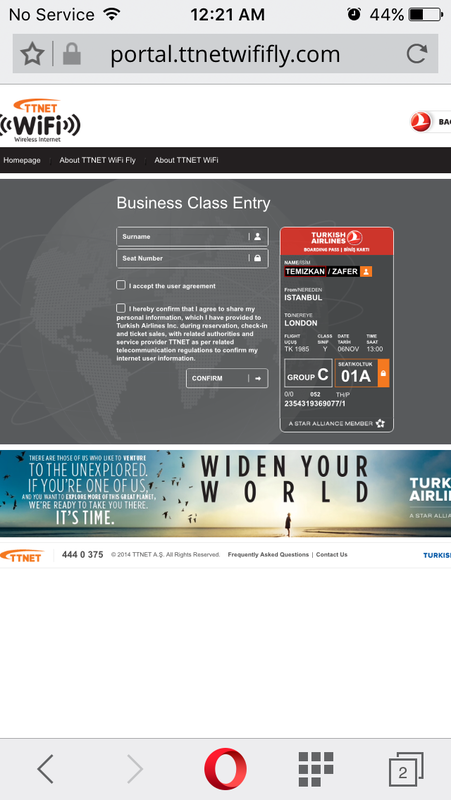 We were happy that our redeemed Aeroplan reward-flight began with Turkish Airlines, as we've always had excellent flights with them. We checked our luggage into the business class counter and were presented with access to the lounge before our flight. Our access was to the Maple Leaf Lounge, which, by other lounge standards, is pretty plain. But nonetheless they have some nice vegetarian snacks, drinks, couches, and wifi for you while you wait for your flight. 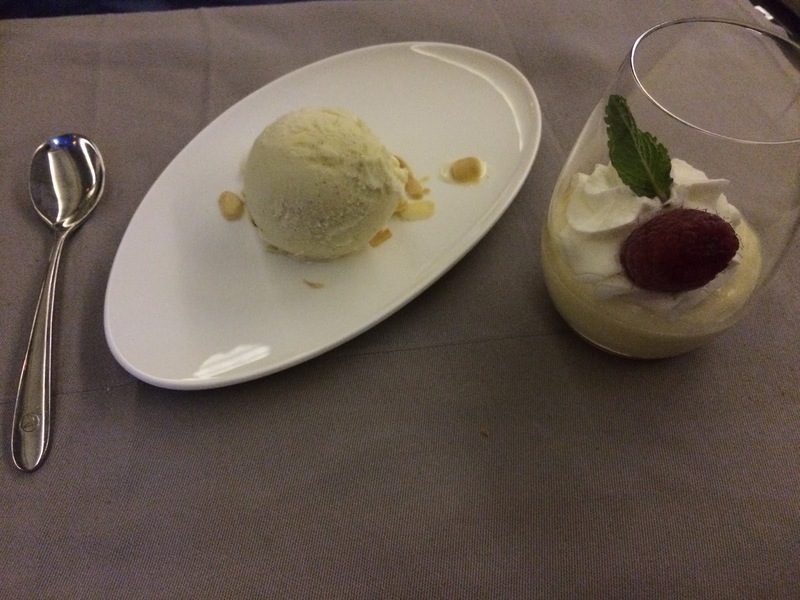 We boarded with the business class and first class group and were greeted warmly by attendants. These were our awesome seats. We always choose to have the seats at the very back row since you don't have to worry about bothering anyone behind you, and you have a little cove of privacy as well. Usually these are unwanted seats since it is close to lavatory, but I actually find that to be a benefit. The seats were provided with back pillows and blankets. The leg room is quite large. The floor area was so spacious that we were able to pray while making full sujood (prostration) during the flight. There was also these nice little storage areas beneath the foot rest for you to put your bags and other items, and near the screen there was a nifty little hook that pops out so you can hang your jacket. Those blue slippers were complimentary as well. 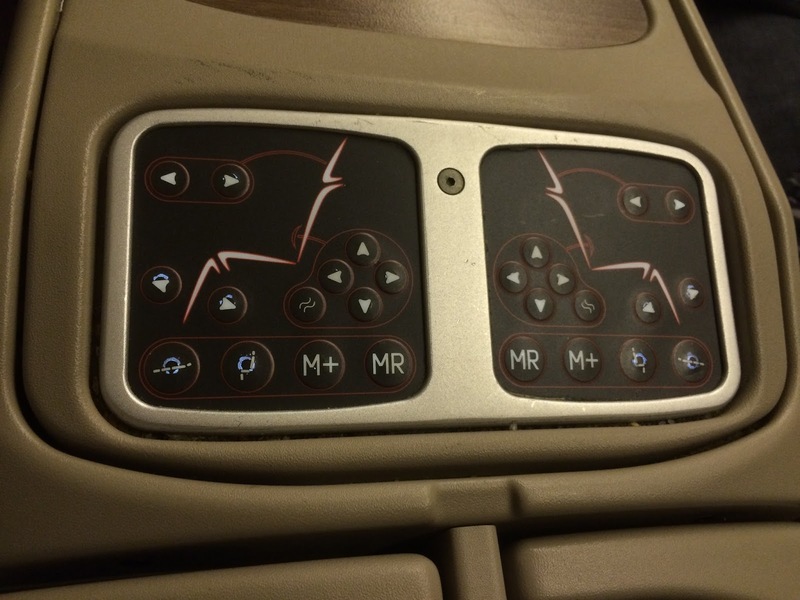 These are the seat controls. You could adjust any part of the chair or click once to make the chair go fully flat, or fully upright. Our controls seemed to be a bit worn out, you had to press hard to make anything happen. One thing that was missing on the controller which I didn't know would be an issue - there was no button to call a flight attendant. 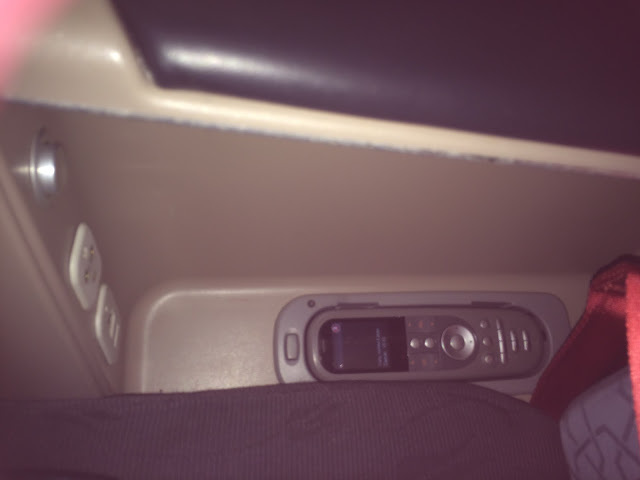 There were many times throughout the flight when the flight attendants were so busy that we had to make several attempts get their attention, but it would've been easier if we had the call button which everyone else has in economy. 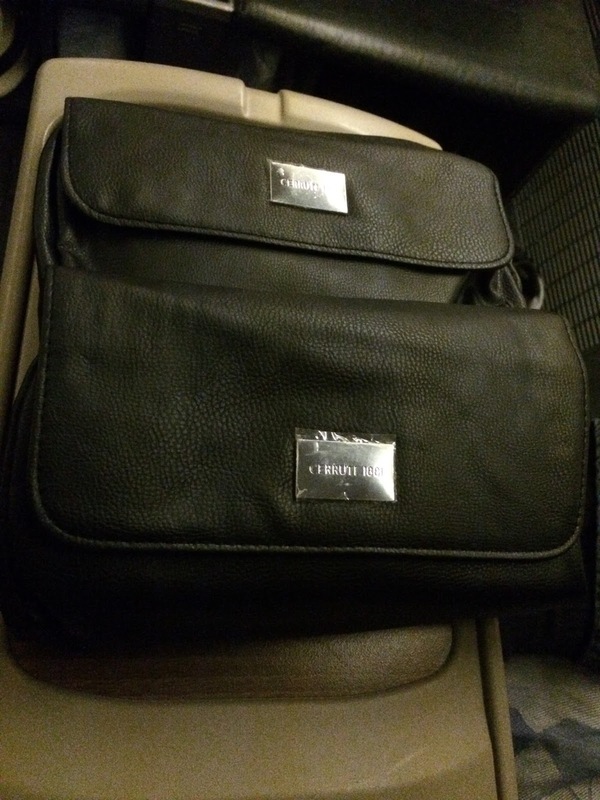 This is the accessories pack you usually get during flights with earplugs and a mask, however business class gets a branded leather bag. This one's by.. Cerruti? I'm not too into brands but it's a nice bag I'll be using again for sure. The accessories inside are more like an experience rather than just flight accessories. It came with the standard earplugs, socks, and eye mask, then lotion, a hair brush, a full tube of toothpaste and toothbrush, info cards about the branded bag, and stickers for you to stick on the side of your chair so the flight attendants will know to wake you up for meal times or leave you if you're sleeping. We were pretty eager since we were flying business class on a long haul flight for the first time, so we stuck the "please wake me up for meal" stickers, which, in retrospect, I wouldn't do again. Being able to sleep properly is the highlight of a long-haul business class flight, and we didn't realize you can just wake up whenever you want and ask for food when you're ready. A few minutes after arriving in our seats we were offered Welcome Drinks (we chose Lemon-mint and Raspberry juices, both delicious). One thing that was interesting was that the flight attendants didn't come around and check our seat belts, or ask us to change our phones to airplane mode or put them away to before take off. It felt a little strange, but I assumed that's part of the business class experience. 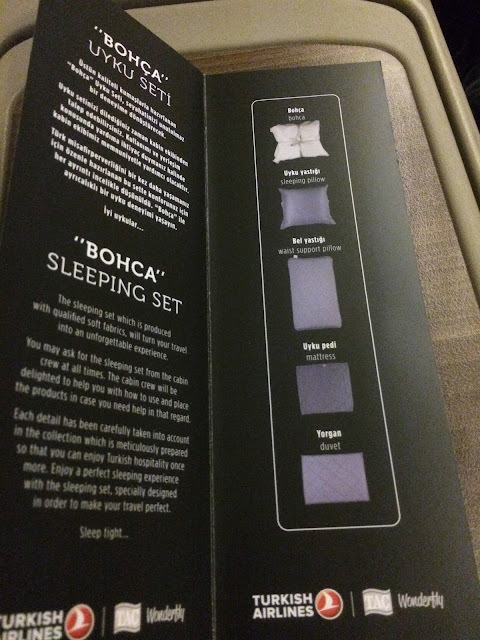 We were handed this interesting pamphlet which explained that we'd be getting a "Sleeping Set", basically a full set of linens for when you lower your chair flat and go to sleep. Super cool! This was the menu we were given, and we were asked to select what we wanted to eat for breakfast. Our names were written on top the menu as well. 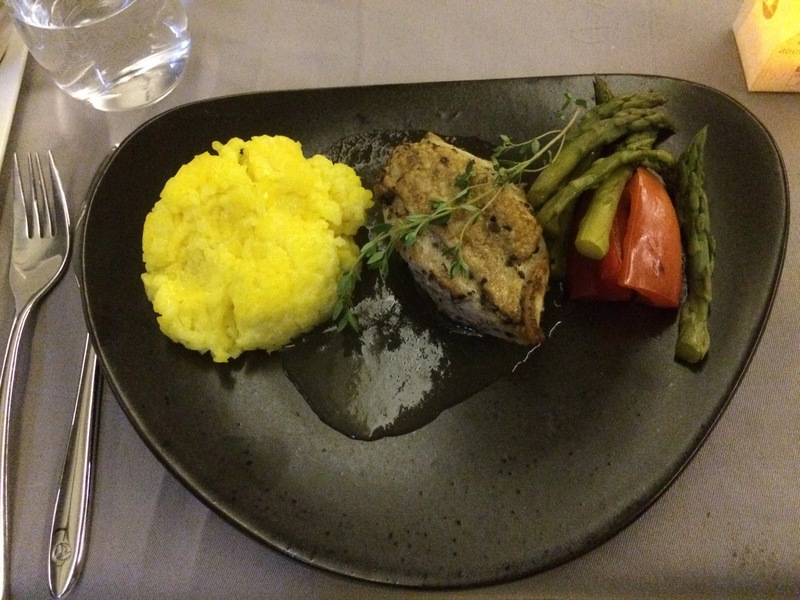 Also, since Turkish Airlines's food is halal, we were excited to have food from the regular menu, since when you order the "muslim meal" on other airlines, the result is usually not as great. There was complimentary wifi on business class! It was super cool being able to talk to my family while we were 30,000 ft above. 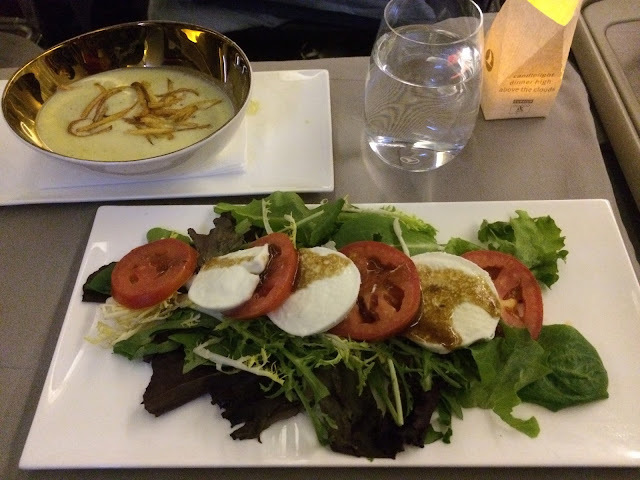 Since our flight was so late, we were unsure whether we should go to sleep or stay up to wait for the dinner service. 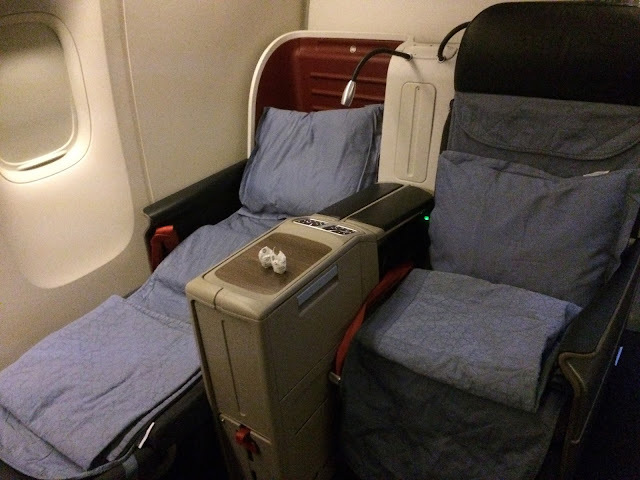 Other passengers were requesting the attendants to set up the Sleeping Sets for their chairs, but they were helping passengers one-by-one from the front rows first. We didn't really need them to do it personally for us (having someone do such easy tasks for me when I can do it myself makes me so uncomfortable), so we awkwardly tried to get someone's attention to ask for two packs. We couldn't get anyone's attention (and there was no call button) so we just grabbed two packs and set it up ourselves, much to their surprise when they finally got to us. It was pretty cozy with a nice pillow and blanket, and a mat that strapped around the head and foot of the seat. A while later we got some nuts and sparkling water..
Then we got these, I guess you would call them amuse-bouches? It was a spring roll, shrimp on toast, and a mini-chicken skewer. A while after that we were served appetizers. The set up of the table was beautiful. There was little electronic candles set in little lantern pockets which flickered like candlelight, and a side dish with olive oil, spices, and butter that had magnetic bottoms which snapped to the plate. Rayyan got shrimp and grilled vegetables, I got "buffalo cheese" and tomatoes with a balsamic dressing, and we both were served zucchini soup topped with potato sticks. The vegetables, shrimp, and soup were a little under seasoned in my opinion, but I guess that's why we were given those cute little spices. I also thought the serving sizes could be half the sizes we were presented, because this plus the previous course was enough food for a full meal. After we were finished the appetizers you have to catch someone's attention to say that you're finished and ask for your main courses. Our main courses arrived - Rayyan had fish with potatoes and vegetables, and I had chicken breast with rice and vegetables. I was kind of hoping it would be food that was a little more Turkish-style, since the economy meals we had on Turkish Airlines in past had been amazing. Nevertheless, it was a nice grilled-style meal, and the presentation was so lovely! I was super happy with the dessert selections, there was a really nice ice cream, baklava, and a vanilla pudding sorta thing. These were excellent. After a few hours of beautiful, lie-flat sleep, we were awoken for breakfast. I decided to share with Rayyan since we were expecting big portions again. We were right. There was a huge plate of fruit, vegetables and cheese, and some sort of yogurt and oatmeal sorta thing. Drinks were a mango yogurt drink and hot chocolate, I had tea as well. Then the main breakfast dish came - an egg omelette with mushrooms, and potato hash browns. Before our descent we were presented with Godiva chocolates (yummy!) and landed in the lovely city of Istanbul. Once we landed, Business and First class passengers are allowed to exit first. One thing we learned from this flight is if you're in Business class, as soon as seatbelt signs come off - you really should quickly grab your stuff and go if you want to beat the crowd to the immigration counters. We had a great flight alhamdulilah but there might be room for improvement. On one hand, the features and extras that this flight gave you was top-notch and was the best of all the flights we experienced in this trip. Everything was so fancy! 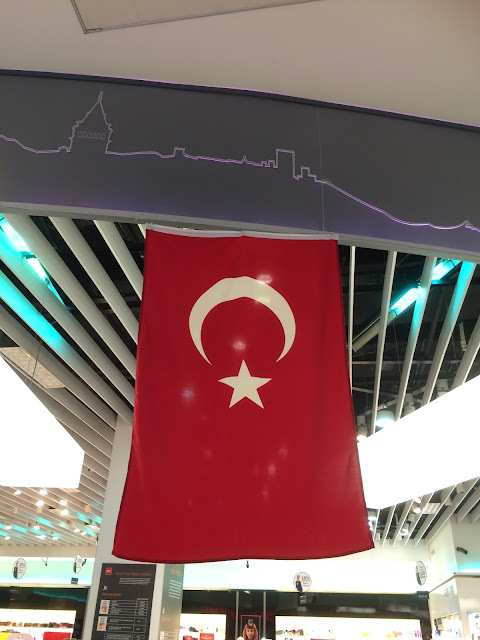 On the other hand, it was harder to get the attention of a flight attendant compared to flying economy, and though beautifully presented, I had hoped for the food to be a little more Turkish when flying on Turkish Airlines. Want more? Check out other articles from this trip at our World Trip Directory! See other updates and fun stuff at our Facebook page!